Slush is just two days away. So to get you in the mood for one of the biggest tech events in Europe, Slush News is looking at three startups whose solutions can benefit any tech conference attendee. Trying to improve your networking game? Pushing your career forward or looking for a co-founder for that great business ideas of yours? Meet meshly, an app that helps you find and connect with other professionals in your relative proximity—be it events, meetups or airports. 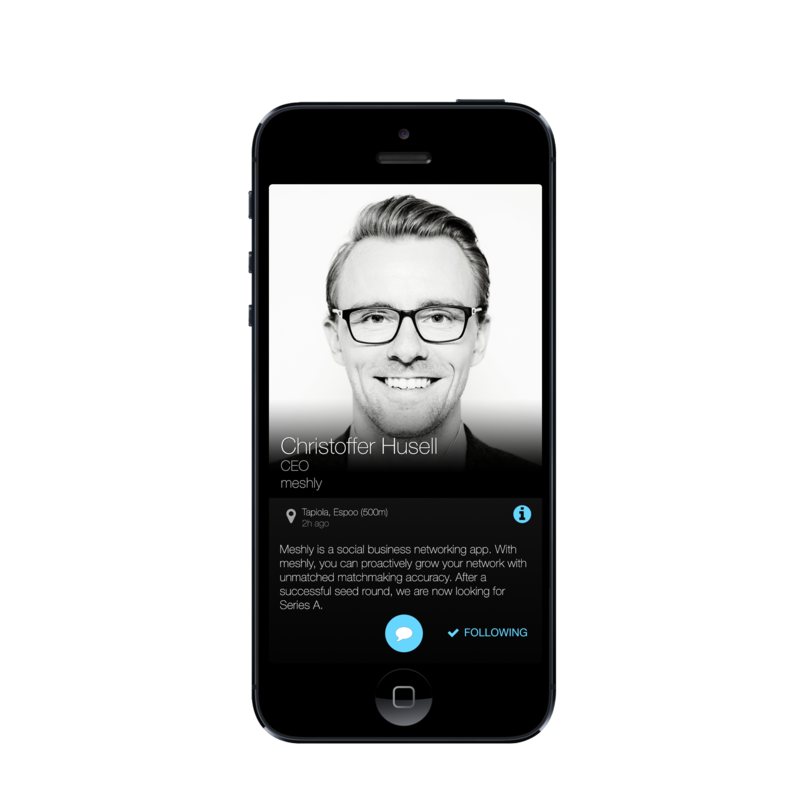 Meshly’s vision is to create the best professional networking experience on mobile. Christoffer Husell, co-founder and CEO at meshly, says that established business networking solutions are built on top of CV templates and serve well recruiters but ignore the needs of today’s mobile professionals. “In order to change this, we have a pure mobile focus. Networking is not a desktop activity, nor is it only events, it’s a lifestyle and an attitude. We are trying to live up to that as we develop meshly”, shares Husell. The app lets you register with your LinkedIn account and then view potential business matches in your vicinity and send messages. Currently, the app is available in the iOS app store, while the team is finalizing the first Android version and promises to release that before Slush.. The competition in the professional networking app sector is tough but no one owns this space yet. So Meshly needs to run fast to gain a large user base and be able to leverage the network effect. At the moment, meshly has got onboard users in the US, the UK, Germany, Sweden, Singapore and even Australia. Mentimeter allows presenters turn the audience’s opinions into data in real-time by letting the audience vote on their mobile phones, tablets or computers. The company’s goal is to create an efficient two-way interaction at conferences and meetings. “People want their opinions and voices to be heard, they want to interact and be engaged”, says Johnny Warström, co-founder and CEO of Mentimeter. The company doesn’t purely focus on big events for audience engagement. Mentimeter’s paying customers from 28 countries like H&M and Accenture use the product to make their meetings and workshops more efficient. By giving an aggregated view of the group’s opinions in real-time, the tool allows teams to have a focused and productive discussion. “Open discussions can turn into tangible data and then you act on this data”, explains Warström. This how it works in practice: the audience goes to the page with a unique ID on their mobile phones or tablets and answer the questions. It takes less than 30 seconds to be able to see the generated view of everybody’s opinion. Questions can be prepared in advance or created spontaneously in seconds. One dimension where the tool can come in very useful is gender equality and culture in companies. Mentimeter allows you to ensure that all voices in your company, no matter gender or position, get heard and contribute to the company’s success. If you want to learn more about the power of data driven culture and its impact on gender equality in startups and tech, make sure to check the thought-provoking talk by Mentimeter’s CEO Johnny Warström on the Yellow stage on Wednesday. As the name of this startup suggests, CloudMic‘s original product turned your iOS and Android devices into wireless microphones. The startup targeted conference organizers by offering them a simple solution to put their microphones into cloud and facilitate greater audience engagement. However, since the startup started to talk to more and more conference organizers, they realized there are much bigger problems that they face. “So we pivoted – we are applying the same technology, but making a more advanced solution for multilingual conferences. We provide real time audio translation to participants’ smartphones”, shares Simona Andrijauskaitė, co-founder of CloudMic. CloudMic promises to eliminate existing conference interpretation equipment. Their mobile solution allows conference participants to listen to translations using their smartphones while interpreter and participants can be in different parts of the world. CloudMic takes part in the Startup Sauna accelerator program so if you want to see them pitch their innovative solution, check out the Startup Sauna Demo Day on Tuesday November 18 at 6pm.